OK. I think I am finally ready to form some words about the Survivor cast. Thing that got me to this place: deciding the puppyish flirting between Jessica and Cole is stupidly adorable. She is me but cute as a button so I am living vicariously through her reactions, and he is a literal puppy and it is wonderful. Even if this last episode did make me facepalm a lot and repeatedly mutter, "damn, he pretty but he dumb." And with that, let's review our remaining lineup in order of favoritism, all of which I expect to be highly subject to order-change because I really do not love any of them. 4. Ali - the brief period in which she attempted to befriend the other tribe outcast [eta: Simone, who btw seemed like a cool person I wanna be friends with] + her cool job as a personal assistant (although the qualifer "to a YouTube star" makes me upset that YouTube stars can afford this) made me feel like she's a pretty neat person. 5. Desi - I know nothing about her, really. She just looks sharp & smart. 6. 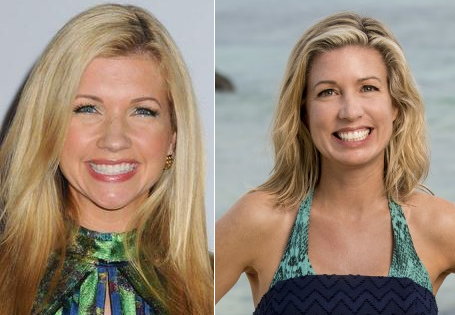 Chrissy Hofbeck, who looks weirdly like actress Susan Yeagley, so I'm basically assuming she's the latter's Til Death character. Mom is very impressed by her "actuary" title, a word I have never actually heard before. 7. Ashley: the girl I'd probably like and see myself in if Jessica were not so delightful. The quasi-pairing of her and JP is the exact same level of bland as Linstead on Chicago P.D., except less pretty. 9. JP, the blandest firefighter I have ever seen. 10. Lauren. Big ball o' meh. 11. Ben, who delights me when I think he's a rugged rancher/cowboy and then grosses me out when he's shirtless and displaying full tattoos. 14. Ryan, whose name I literally thought was Keith, and whom I have been calling Lil' Gremlin. In other news, my moron self thought I would be fine taking a walk in my sneakers without socks because I hadn't suffered any ill effects wearing them that way for errands over several days, and then that walk ended up being almost 2 hours, and I came home with[blister talk hidden for the squeamish]a dime sized blister on the side of my heel (which doesn't really hurt, it's just MASSIVE), and a smaller one on the opposite foot where it shouldn't even possible to get one, on the crease of the sole between the ball of the foot (below the big toe) and where the arch begins. She pretty but she dumb, in other words.